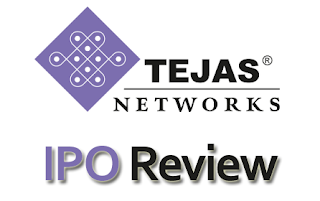 » IPO Updates » IPO Updates : Tejas Networks Ltd.
IPO Updates : Tejas Networks Ltd.
Tejas Networks Ltd is an India-based optical and data networking products company with customers in over 60 countries. They design, develop and sell high-performance and cost-competitive products to telecommunications service providers, internet service providers, utility companies, defence companies and government entities (collectively, “Communication Service Providers”). Its products are used to build high-speed communication networks that carry voice, data and video traffic from fixed line, mobile and broadband networks over optical fibre. Currently, India is its largest geographic segment which accounts for 65 % of revenues, whereas it caters rest 35 % from International market. The Company is positive about boost in growth through opportunities arising out of the Digital India and the Make-in-India programs of the Indian Government. The IPO comprises fresh issue of shares worth Rs 450 crore and an offer for sale of 1.27 crore scrips by existing shareholders. Shareholders who would sell stake in the initial public offer (IPO) include Cascade Capital Management Mauritius, Intel Capital (Cayman) Corporation, India Industrial Growth Fund Ltd and Sandstone Private Investments. Tejas is the second largest optical networking products company in terms of market share in India, with a market share of 15% in the overall optical networking market. Apart from financial positives, Tejas is an renowned brand in various states in India. The Company has failed to generate positive cash flows during past 2 years which too is a matter of concern. Moreover the company manages to earn a very low profits, it has made losses in 3 out of past 5 years. Investors should only look upon for the companies which maintain a stability in earnings. The Company has priced the issue very aggressively and in no way it will be in favor of investors to invest in the company. The Company has not been able to earn decent profits except last year which i prefer to avoid (as there may be manipulations considering that they had to come up with an issue). I therefore, would prefer to stay away from such an highly priced issue.